Pour 3/4 cup of the dressing over shrimp; cover. Refrigerate 1 hour to marinate. Preheat greased grill to medium heat. Drain shrimp; discard marinade. Thread shrimp onto skewers. Grill 2 to 3 min. on each side or until shrimp turn pink. Remove shrimp from skewers. Reduce grill to low heat. Chop shrimp; place in medium bowl. 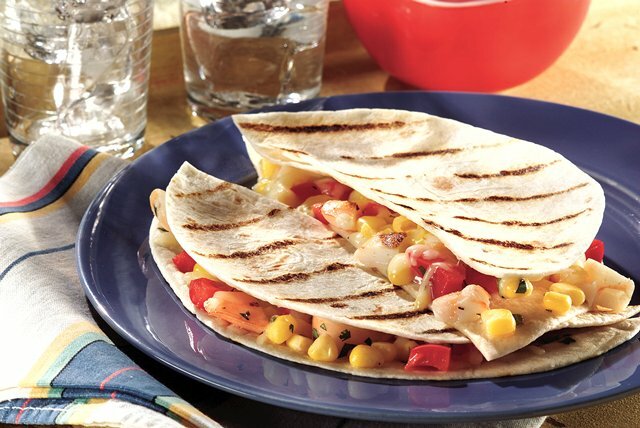 Add corn, red pepper, cheese, cilantro and remaining 1/4 cup dressing; mix lightly. Spoon evenly onto 10 of the tortillas; cover each with second tortilla. Return to grill. Cook 2 to 3 min. or until tortillas are golden brown on both sides and cheese is melted, turning after 1 min. Substitute 2 cups blanched fresh whole kernel corn for the package of frozen corn.